by Jacqueline Visconti (ed.). Milano, LED Edizioni universitarie 2010. Der Sammelband Lingua e diritto. Livelli di analisi vereinigt Beiträge von Wissenschaftlern ganz unterschiedlicher Fachrichtungen: Anthropologie, Rechtstheorie und –philosophie, Vergleichende und Europäische Rechtswissenschaft, sowie Übersetzungswissenschaft, Diskursanalyse, Pragmatik, Morphosyntax und Kognitive Linguistik. Die Beiträge beschäftigen sich mit einer Vielzahl von Aspekten an der Schnittstelle zwischen Sprache und Recht: Fragen der Bedeutung und der Auslegung von Rechtstexten, dem Wesen der Rechtsauslegung, Problemen von Mehrdeutigkeit und Vagheit in Rechtstexten, Merkmalen der Rechtssprache, Rechtsterminologie und der Mehrsprachigkeit im Europarecht. Insgesamt liefert das Buch Einblicke in eine Vielzahl von Themengebieten und Perspektiven im Spannungsfeld von Sprache und Recht und ist damit ein wertvoller und sehr willkommener Beitrag sowohl für Rechts- als auch für Sprachwissenschaftler im Bereich der Rechtslinguistik. The book Lingua e diritto. Livelli di analisi brings together contributions by scholars from different fields: anthropology, theory and philosophy of law, comparative law, European law, translation, discourse analysis, pragmatics, morpho-syntax and cognitive linguistics. Contributions deal with a number of issues situated at the interface between language and law: questions of meaning and the interpretation of legal texts, the nature of legal interpretation, problems of ambiguity and vagueness in legal texts, the characteristics of legal language, legal terminology and the multilingualism of European law. As a whole, the book provides insights into a number of different topics and perspectives situated at the interface between language and law. It is of interest both to lawyers and linguists as a valuable and very welcome contribution to the field of legal linguistics. The book Lingua e diritto. Livelli di analisi brings together contributions by scholars from different fields: anthropology, theory and philosophy of law, comparative law, European law, translation, discourse analysis, pragmatics, morpho-syntax and cognitive linguistics. Contributions deal with a number of issues situated at the interface between language and law: questions of meaning and the interpretation of legal texts, the nature of legal interpretation, problems of ambiguity and vagueness in legal texts, the characteristics of legal language, legal terminology and the multilingualism of European law. The first group of contributions deals with issues of meaning and the interpretation of legal texts. In Introduzione alla teoria dell´interpretazione (,Introduction to the theory of interpretation´, pp. 61-74), Riccardo GUASTINI points to four different meanings of the word "interpretation". Firstly, it may refer to an activity, or its result. Secondly, the author distinguishes interpretation in abstracto, which is text-oriented and consists of identifying the content, from interpretation in concreto, which is fact-oriented and defines the extension of a concept. The former identifies the meaning of an appropriate norm, while the latter identifies concrete cases where a particular norm can be applied. Thirdly, the author distinguishes between a) cognitive interpretation, which involves the identification of different meanings of a normative text based on linguistic rules and different interpretative techniques, b) decision-making interpretation, which consists of choosing one among several meanings identified by means of cognitive interpretation, and c) creative interpretation, which consists of attributing a "new" meaning to a text. Furthermore, interpretation may refer to attributing a meaning to a text, to judicial construal, involving the ratio of a norm, establishing hierarchies of norms, the elaboration of implied norms including "general principles", and the balancing of conflicting norms. According to the author, law involves double indeterminacy: the indeterminacy of the legal system as a whole, and indeterminacy of each of its components, i.e. individual norms. A normative text may be ambiguous, so that it needs to be decided whether it expresses N1 or N2. On the other hand, any norm is vague or indeterminate, which means that its scope of application has to be determined. As opposed to ambiguity, vagueness (open texture) is an objective property of language, so that each generic term applies to a number of individual referents. Thus interpretation in concreto reduces the indeterminacy of norms. Finally, interpretation may involve implicit norms, i.e. norms that have not been formulated by any authority. In Analisi linguistica e teoria dell´interpretazione giuridica: Ancora sulla sempiterna disputa tra scettici e misti(ci) (,Linguistic analysis and theory of judicial interpretation: about the eternal dispute between skeptics and mystics´, pp. 75-96), Pierluigi CHIASSONI discusses theories of judicial interpretation in general, and then examines the analytical theory of Eugenio Bulygin. According to the author, confusions regarding the theory of interpretation may arise from a lack of distinction between discourses with descriptive function (description, explication, theory) and discourses with a prescriptive function (prescription, doctrine, ideology). In discussing the nature, structure or instruments of judicial interpretation confusion may arise from a lack of distinction among three different perspectives: psychology of judicial interpretation, methodology of judicial interpretation and theory of social action. In I giudici e il linguaggio (,Judges and language´, pp. 97-101), Mario GARAVELLI analyzes relations between language and "law in action" in judicial decisions. The judge is not regarded as a bouche de la loi that simply applies legal norms to particular cases; it is widely recognized that judicial activity has a creative function. The author stresses the importance of judicial interpretation both regarding the meaning of legal norms and the reconstruction of facts based on evidence. Ambiguity, indeterminacy and vagueness are discussed within the framework of "law in action". In Referenti in testi normativi (,Referents in normative texts´, pp. 339-51), Giuseppe LORINI provides a classification of descriptive terms based on the Charter of Fundamental Rights of the European Union (2000). The author distinguishes five types of terms: 1) terms designating ontological entities, 2) terms expressing values, 3) terms with a deontic status, 4) terms denoting institutions, and 5) terms denoting institutional entities. In the contribution Il linguaggio giuridico nella prospettiva computazionale (,Legal language from the perspective of computer science´, pp. 321-37), Daniela TISCORNIA describes different approaches to the linguistic analysis of law, pointing to the role of "ontological" methods in dealing with legal semantics. On the one hand, it is necessary to link formalized models to an adequate linguistic interpretation; on the other, the social dimension of meaning should be taken into account. The author illustrates the role of applied ontologies, which is not only to provide a semantically solid structure for the lexicon, but also to express a possible, though not exclusive, interpretation of textual contents. In this way, applied ontology can give valuable methodological support to legal science. Several contributions focus on the characteristics of legal language. In the contribution entitled Il principio dell´economia nella lingua giuridica: Gli avverbi in –mente (,The principle of economy in legal language: Italian adverbs ending in –mente´, pp. 119-62), Giovanni ROVERE discusses the principle of language economy as a feature of legal language. According to the author, language economy is a secondary consideration in languages for specific purposes, where precision has the central role. The fundamental manifestations of language economy are polysemy and terminological lexicalization. The substitution of periphrases, descriptions and explanations by technical terms is the most economic form of denotation in languages for specific purposes. Language economy is a constitutive element of communicative efficiency. The author goes on to analyze the use of Italian adverbs ending in –mente in legal language as an expression of the principle of language economy. In Condizioni restrittive nei codici tedeschi e italiani (,Restrictive conditions in German and Italian codices´, pp. 203-30) Marcello SOFFRITTI provides a contrastive analysis of conditional constructions in Italian and German legal texts, focusing on connectors, in an attempt to establish the applicability of the distinction between generic and restrictive hypothetical connectors in the two languages. The corpus is based on the Bürgerliches Gesetzbuch, the Codice Civile – the Strafgesetzbuch, the Codice Penale, the Strafprozessordnung and the Codice di Procedura Penale. 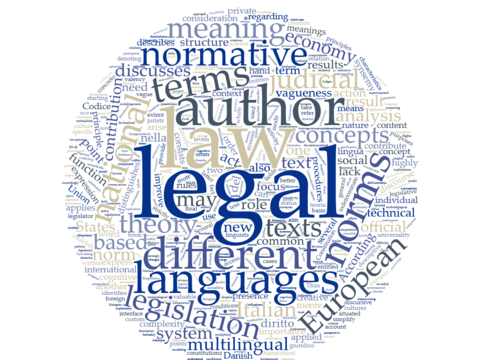 The analysis reveals important indications regarding a wide range of hypothetical expressions in the two languages under consideration, as well as the main conditions for their use in normative legal texts. In Xenonimía sinonimía sinsemía (pp. 353-69), Amedeo Giovanni CONTE proposes several theses on the relationship between language and thought, or on the function of language. He goes on to introduce and explain the meaning of the terms: xenonymy, synonymy and synsemy. A xenonym is a term which translates another term from a foreign language. Synonymous terms denote the same Sinn (in the sense of Gottlob Frege), while synsemy applies to terms that have the same Bedeutung. The author describes transitivity and intransitivity in relation to xenonymy, synonymy and synsemy. Language in the courtroom is discussed by Bice Mortara GARAVELLI in Condizioni di eterogeneità discorsiva nel dialogato di procedimenti penali (,Conditions of discursive heterogeneousness in dialogues in criminal procedures´, pp. 103-18). The analysis is based on a corpus of recordings of witness examinations and interrogations of the accused at the Court of Turin. The author discusses the asymmetrical nature of court interactions which are strictly prescribed. The dialogue is organized in terms of the relationship between status and role, on the one hand, and discursive rights and obligations on the other. Turn-taking is strictly defined by rules of procedure. The modes of control over discourse are revealed by discourse indicators, meta-discourse comments and interactional controllers. The author analyzes different levels of formality, the presence of legal bureaucratic jargon alongside colloquial and substandard modes of expression, language varieties linked to the cultural background of participants, and the presence of code mixing. In Lingua, cognizione e due costituzioni (,Language, cognition and two constitutions´, pp. 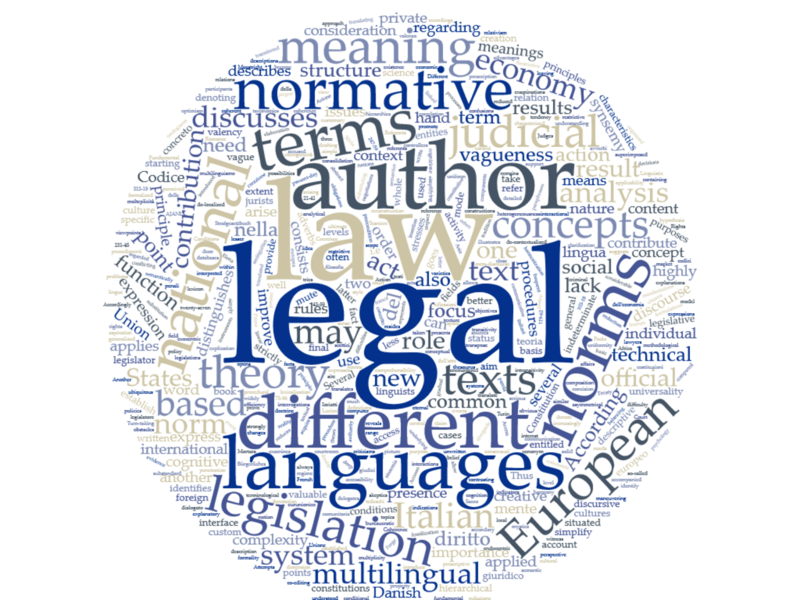 163-202), Iørn KORZEN attempts to apply the Sapir-Whorf hypothesis and the notion of linguistic relativism to legal language. He also proposes a distinction between "endocentric" and "exocentric" languages, the former being exemplified by Germanic, and the latter by Romance languages. Finally, the author compares the language of the Danish and Italian constitutions in an attempt to prove the existence of a correlation between a linguistic system and the world picture. Accordingly, the focus on the relation between events results in a more synthetic, systemic and hierarchical mode of thinking in Italian compared to more linear Danish mode, where the focus is on each individual event. As a result, the composition of the Italian Constitution is much more hierarchical and systemic than the Danish Constitution. Some contributions take anthropology as their starting point. In Azione, pensiero, parola nella creazione del diritto (,Action, thought and the word in the creation of law´, pp 21-41), Rodolfo SACCO discusses the importance of written vs. unwritten sources of law, with custom as the basis of both common law and international law, as well as present-day customary law in Africa and Asia, contrasting the "letter of the law" to the "law in action". The purpose of African legal systems, for example, is to maintain social cohesion and harmony. European law, when imposed on African social reality led to the fossilization of legal rules. According to the author, the reduction of custom to written law requires precise formulations which results in a highly technical language used to express concepts which cannot be transferred from one legal culture to another. Comments on the concepts of "mute" vs. "spoken act" in the legal theory of Rodolfo Sacco are provided by Paolo DI LUCIA in his contribution Il concetto di valenza nella filosofia dell´atto giuridico (,The concept of valency in the philosophy of the legal act´, pp. 43-59). The author tries to identify a deep structure of the legal act underlying both the spoken act and the mute act and refers to the valency theory of Lucien Tesniere. Several contributions focus on issues relating to EU law, multilingualism and translation. In Coerenza del diritto private europeo: Il problema del multilinguismo (,Coherence of European private law: the problem of multilingualism´, pp. 231-45), Gianmaria AJANI discusses the possibilities of legal "transplants" and the complexity of translation as their basic precondition. The idea of establishing norms common to different nations is not new – the claim to universality has always had an important role in international law. The aspiration to universality results in norms which are increasingly generalized and abstract. In the context of EU law, this tendency opens the door to legal transplants, leaving the contents of a norm highly indeterminate. The multilingual policy of the EU is a result of "normative optimism" based on the belief that it is possible to translate a norm from one language into another as a means of achieving uniformity in the multilingual legal system. Secondary legislation is expected to have the same normative meaning in all the official languages. 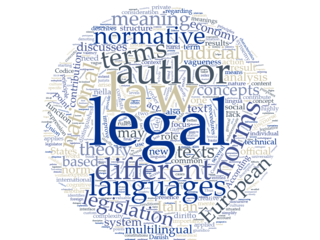 However, the author points out that legal terms acquire their meaning according to existing taxonomies where their semantic content is determined by legal tradition, and there is no possibility of foreseeing how the norms will be understood and interpreted on a local level. The problems are less pronounced in legislation regulating the common market, but they become very complex in the harmonization of private law, where EU law is superimposed on very different national legal cultures. The EU legislator should take into serious consideration national concepts in order to improve the comprehensibility and coherence of the system of principles, legal norms and terminology. The consolidation of a common legal culture would then promote the de-contextualized reading of legal texts and concepts – this would allow a coherent legal reasoning, bringing together the European and national levels. This approach is based on the view that language is a strongly creative element of law. In the contribution entitled La lingua del legislatore europeo (,The language of the European legislator´, pp. 247-59), Silvia FERRERI presents different criticisms of the language and style of EU legislative texts by national jurists, who point to their lack of precision and frequent ambiguities. As a result, there have been attempts to improve EU legislation by simplifying its language. It soon became obvious, however, that legal language is highly technical and cannot be reduced to everyday language; substituting a technical term with an ordinary word does not contribute to its clarification. Attempts to simplify legal language often result in long explanatory paraphrases which do not contribute to better communication. The author concludes by emphasizing the need for close cooperation between jurists and linguists in EU legislation, involving an exchange of different viewpoints that can contribute to better mutual understanding. In Linguismo eurunionico e redazione della norma comunitaria scritta: Prime riflessioni (pp. 261-312), Elena Ioriatti FERRARI describes the EU legislative procedures and complex processes of multilingual legal drafting and co- editing. The complexity of normative production also depends on the fact that its basis is not consensual but institutional. The ultimate expression of complexity resides in the multilingual context where norms are formulated, and the multilingual regime of EU legislation requires the co-editing of normative acts in all the official languages. In this respect, the difficulty of translating legal concepts into different languages is compounded by the need to transpose a new concept into twenty-seven different legal cultures, with the final aim of achieving uniform application in all Member States. In order to simplify the translation procedures to some extent, the so-called procedural languages, namely English, French, and, to a lesser extent, German, are commonly used. English, as the European lingua franca, is often perceived as being less precise and characterized by greater vagueness. The use of vague concepts allows national delegates considerable maneuvering space which enables the penetration of national policies into EU legislation. A normative text represents the final point in the process of negotiations and the starting point for the process of interpretation. Thus, the content of a normative text remains open-ended. The gradual creation of a legal language for each of the official languages of the EU results from the need to express the concepts of a new legal order which is different from that of Member States. The EU normative language is a "de-localized" language lacking a context of reference for interpretation. The ubiquitous presence of neologisms is accompanied by the insertion of definitions, resulting in a loss of concision. The author also provides a detailed account of the structure of EU normative texts. In Unione europea: Accesso al diritto e molteplicità delle lingue (,European Union: Access to law and multiplicity of languages´, pp. 313-19), Pascale BERTELOOT discusses the need to provide access to the national legislation of Member States – this has become especially pronounced after the Treaty of Maastricht, which stresses the importance of national law and cooperation in the fields of justice and home affairs. To this aim, the N-Lex site has been established enabling access to the official legislation of Member States. Different obstacles have been encountered, including the language problem arising from the fact that national databases have been developed in national languages of Member States. Language problems are compounded by conceptual difficulties that may arise from a lack of knowledge of a foreign legal system. The European Union has developed its model of "abstracts for citizens" which provides a simple synthesis of the objectives, advantages and changes introduced by new legislation. The author suggests that a similar system of abstracts translated into several languages could be developed for national legislation to improve its international accessibility. Another possibility would be to establish a multilingual thesaurus containing concepts from all national legislations in all the official languages. As a whole, the book provides insights into a number of different topics and perspectives situated at the interface between language and law. It is of interest both to lawyers and linguists as a valuable and very welcome contribution to the field of legal linguistics. [Esedra. Collana di letture; 23]. Milano, LED Edizioni universitarie di Lettere Economia Diritto 2010. ISBN: 978-88-7916-442-9. Sočanac, Lelija (2011). „Review of „Lingua e diritto. Livelli di analisi“ by Jacqueline Visconti (ed.). Milano, LED Edizioni universitarie 2010″. Zeitschrift für Europäische Rechtslinguistik (ZERL). Köln: Europäische Rechtslinguistik, http://zerl.uni-koeln.de/socanac-2011-review-lingua-diritto.html, (Datum des letzten Zugriffs). URN des PDFs: urn:nbn:de:hbz:38-74723.